Waiheke’s annual Easter celebration serves up a feast of JAZZ, ART & MUSIC all weekend long. The Festival takes place at various venues across Waiheke, including Rangihoua Estate, Batch Winery, Artworks Theatre and Aperitivo Wine Bar. 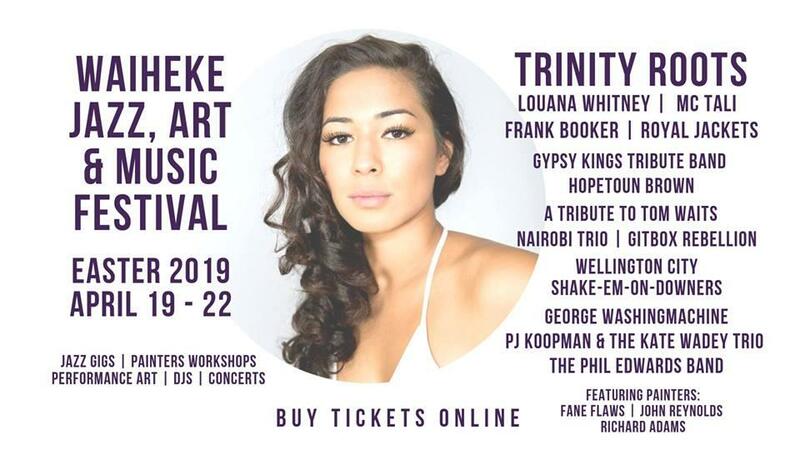 Confirmed Jazz acts include Nairobi trio, the Wellington City Shake-Em-On-Downers, and from Sydney, the hugely talented Kate Wadey Trio with guitar virtuoso PJ Koopman. Joining them are George Washingmachine and son Arthur on gypsy guitar. Artists John Reynolds, Fane Flaws and Richard Adams will deliver a painter’s workshop, followed by a one-off performance-art experience, painting to a live performance by Fane’s band “No Engine”. Works will be auctioned off after the show. SUPPER CLUB – Aperitivo Wine Bar, Saturday 20th April 9.30pm – midnight. Jazz concerts, Contemporary music gigs, DJ’s, abstract and figurative painting and collaborative performance art involving painters, musicians and the audience. Fullers 360 are offering ferry and bus packages. All venues are licensed, so don't bring food, alcohol or dogs please. We're kid friendly - check out the web-site and Facebook pages for more information. Some venues are limited to capacity so buy your tickets TODAY!